Featured Why choose an express bus for your North Island holiday? On the North Island’s east coast, just south of Auckland, lies the scenic Coromandel Peninsula. Kiwis call it ‘The Coromandel’ and it is a favourite holiday destination due to its unspoilt landscape and relaxed lifestyle. Framed by native pohutukawa trees on the western side, beautiful white sandy beaches on the east and divided by ranges cloaked in native rainforest, the Coromandel’s 400km of coastline offers the visitor a truly distinctive blend of experiences. 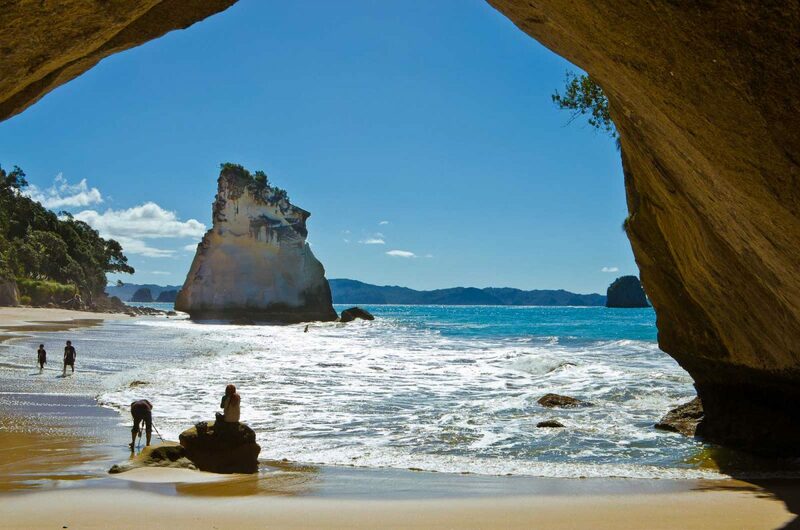 Made famous by the ‘Chronicles of Narnia’ movies, this beautiful beach is divided by a stunning rock arch. It is situated between Whitianga and Hahei and access is by boat or on foot. The walk is worth it for the stunning view when you arrive – have your camera ready!. Handy tip: access to the ‘cathedral’ is sometimes limited by rockfalls – pay attention to any warning signs you see. Hot Water Beach on the Coromandel’s east coast is a unique New Zealand experience. At first glance the beach looks like any other New Zealand surf beach. Follow the crowds with their spades to a spot under the headland, and you’re in for a surprise. Here, natural hot springs bubble up under the sand. Dig yourself a shallow hole to create your own personal spa pool, right on the beach! The water can be seriously hot, so you’ll want to get the mix of hot and sea water just right. The best time to visit Hot Water Beach is within two hours either side of high tide, so check a Coromandel tide chart before you head to the beach. You’ll need a spade to dig your pool. Some Coromandel accommodation providers will lend you one, but you can also hire them from the nearby store. About halfway up the peninsula is the historic town of Coromandel, once the booming hub for the region’s goldmining industry. Today it’s better known for its arts and crafts scene, the surrounding native rainforest and the local Driving Creek Railway. Scallops rank up there as one of New Zealanders’ favourite seafoods. Unsurprisingly, the annual Whitianga Scallop Festival is one of New Zealand’s most popular festivals! Local farmers, cafes and restaurants serve authentic New Zealand cuisine, with entertainment and live music. The scallop festival takes place on Whitianga’s stunning waterfront every August. The roads around the Coromandel Peninsula are narrow and winding. They can therefore be dangerous for travellers who are not used to New Zealand driving conditions. InterCity runs daily buses to the Coromandel from Auckland, Hamilton and Tauranga. You can catch a bus to the Coromandel from the main Auckland bus stop in the city centre, or from Manukau. Handy tip: If you’re travelling to the Coromandel with an InterCity FlexiPass, make sure you check the network map as some Coromandel bus services are not available. This is a one-stop shop for planning New Zealand travel, with everything you need to know about getting around NZ! Find out about cheap bus travel and NZ bus passes, read about backpacker tours, and get handy hints on how to save money while you travel. Why choose an express bus for your North Island holiday?